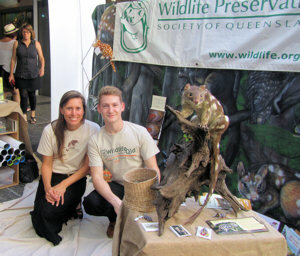 On 7 September, Wildlife Queensland took conservation to the people in the Queen Street Mall, Brisbane. quoll, the mahogany glider and the Richmond birdwing butterfly were profiled, with their distribution, conservation status, requirements and threats explained to attendees. We then outlined Wildlife Queensland’s actions to mitigate these threats offering the public opportunities to participate in or contribute financially towards our efforts to conserve threatened species in Queensland. National Threatened Species Day provides an excellent avenue to highlight both the plight of our threatened species and the ongoing efforts of Wildlife Queensland to combat this decline of our native fauna. Memberships, facebook followers and adoptions experienced a spike in the two weeks following National Threatened Species Day although the source of each is not specified. It is still not too late. You can Adopt a Glider or Adopt a Quoll anytime. If not for yourself, consider it a Christmas gift for someone special – and give twice.